Employees and job seekers often have questions about overtime, unused vacation time, comp time, wages, and other employee rights issues. Employment law can be confusing, and it can be difficult to learn what your rights are and what you are entitled to. Because employment law is so complicated, employees often don’t even know what their rights are regarding vacation, comp time, commissions, and more. In fact, some employees don’t even know when an employer is violating a workplace law. Below is a list of the top twelve workplace violations that employees should be aware of. Read this list of violations to make sure you know your rights, and to ensure that you are being compensated fairly. When your duties include putting on or taking off a uniform or personal protective equipment, performing a stock inventory, setting up and cleaning your work area, or attending a change-of-shift-meeting, you're entitled to your regular wages for the time you are engaged in those activities. You're also entitled to compensation for any "extra" hours you work, such as working through your lunch break, even if your employer didn't require you to work the extra time. These are all considered compensable time. Your employer is legally required to pay you for all compensable time. The Fair Labor Standards Act (FLSA) does not require employers to pay employees for unused vacation time. Vacation and other time off from work are not regulated by the FLSA. However, some states require payment of unused vacation leave upon termination. Company policy is also a factor. If the employer does provide paid vacation, the time accrued (collected) becomes part of the employee's compensation as per company policy and state law. If you are fired or you quit, and you have vacation time accrued, you are entitled to payment for that time. Some employers who provide vacation time adopt a "use it or lose it" policy, where they require employees who don't use their accumulated vacation by the end of the year to lose it. Use-it-or-lose-it policies are illegal in some states, including California, Montana, and Nebraska. Other states including North Dakota, Massachusetts, and Illinois require employers to give their staff a reasonable opportunity to use their vacation time before losing it. Some states, including New York and North Carolina, require employers to formally notify staff of any policies indicating that they will lose vacation if they don’t use it. Your compensation may include commissions or bonuses based on performance benchmarks, such as production or sales quotas. Bonuses and commissions are not regulated by the FLSA. Whether or not you're entitled to bonuses or commissions is determined by your agreement with your employer and the laws of the state where you work. However, if you have been promised a bonus or commission for achieving certain benchmarks, and you have achieved those, you are entitled to receive the commission or bonus promised by your employer. If your employer does not give you a promised bonus or commission, he or she is violating employment law. Confusion about exemption rules is common among both employers and employees. Despite what many people think, exemptions have nothing to do with your title or job description. Whether you receive a salary rather than an hourly wage is not necessarily enough to determine your status either. Be aware of your salary level and job duties, as they are the determining factors for your classification. Knowing whether or not you are exempt is important because exempt employees are not entitled to receive overtime pay as guaranteed by the FLSA. Independent contractors, by definition, are self-employed workers who are not covered by the tax and wage laws that apply to employees. This is because employers do not pay Social Security, Medicare or federal unemployment insurance taxes on independent contractors. If you are not an independent contractor, make sure your employer isn't classifying you as one. Independent contractors are not eligible for certain benefits such as medical, dental, and unemployment benefits. Under the FLSA, overtime pay rules are based on a 40-hour workweek. The FLSA states that all work over 40 hours in a workweek must be paid at a rate of one and one-half times the employee's regular hourly rate. Non-exempt employees may be paid on a weekly, bi-weekly, semi-monthly, or monthly basis, but overtime is always calculated by the Monday through Friday workweek. Make sure you're keeping track of your hours worked, and make sure that you are receiving properly calculated overtime pay. Compensatory time, commonly referred to as "comp time," is generally paid time off granted instead of overtime wages. 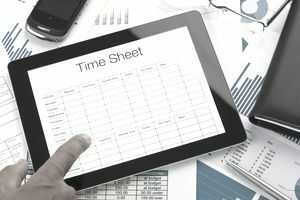 For example, rather than paying employees time-and-a-half for overtime during a busy season, a business may offer comp time to be taken at a later date. While comp time may be legal depending on the classification of the employee, it must always be paid at the same rate as overtime wages: 150%. According to the FLSA, private employers can only give comp time if it is in the same pay period as the overtime work. There are also differences between comp time for exempt and non-exempt employees. Non-exempt employees must be paid overtime. Giving non-exempt employees comp time is a violation of employment law. Make sure you are receiving proper compensation for overtime work. Many employers establish rules that overtime work will not be permitted or paid without prior authorization. Some choose to "look the other way" when non-exempt employees work overtime and don't allow those hours to be reported. These policies don't comply with the FLSA. Employees must report their overtime hours. As of July 24, 2009, the federal minimum wage for most covered employees is $7.25 per hour. Some exceptions include certain student workers and certain disabled workers, who may be paid at a lower rate. The minimum wage for young workers under the age of 20 is $4.25 per hour during their first 90 days of employment only (consecutive calendar days, not days of work). This applies to every job a person has until he or she turns 20. It does not just apply to his or her first job. Workers who receive tips on the job may be paid a minimum hourly rate of $2.13, as long as the hourly rate plus tips received totals at least $7.25. Make sure you are receiving the proper minimum wage (at least) based on these requirements. Twenty-eight states and some cities have higher minimum wages so be sure to review the statutes in your location. For example, Arizona, California, Colorado, Hawaii, Maryland, Massachusetts, Oregon, Rhode Island, Vermont, and Washington all have established a minimum wage of $10 or more. A whistleblower is someone who complains about illegal activity or activity in violation of company policy at an employer. A whistleblower can be an employee, supplier, client, contractor, or anyone who may have insight into any illegal activity occurring at a business or organization. Those complaints are often voiced in public or reported to government or law enforcement agencies. Whistleblowers have often been fired by the company they work for. Whistleblowers that do retain their jobs may face blacklisting, demotions, overtime exemptions, benefit denial, threats, reassignment, or a reduction in pay. The Whistleblower Protection Act provides legal protection for federal employees in addition to the protective laws created by the Securities and Exchange Commission (SEC) and Occupational Safety and Health Administration (OSHA). Unequal treatment or harassment based on race, gender, religion, age or nationality in the workplace or as part of the hiring process is expressly prohibited by the Civil Rights Act of 1964. Sexual harassment is one widespread form of workplace discrimination. While not all unfavorable treatment constitutes unlawful discrimination, any employee who believes that he or she has experienced workplace discrimination can file a complaint with the EEOC (The Equal Employment Opportunity Commission). Here's how to file an employment discrimination claim. If you think your employer is committing a workplace violation, your first step is to get as much information as you can. Check out the elaws Advisors—these are interactive tools provided by the US Department of Labor. These can give you more information about a number of federal employment laws. Contact your State Department of Labor Office for information about employment laws impacting your state. Ask your Human Resources office or labor union for clarification of any employer policies as a first option to redress any grievances. Consult an employment lawyer if you are not satisfied with any resolution of issues surrounding your situation.